↑ 1.0 1.1 ਐਨਰੀਕੋ ਫ਼ੇਅਰਮੀ at the Mathematics Genealogy Project. 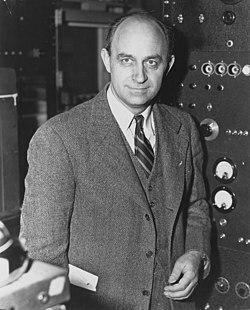 ↑ 4.0 4.1 "Enrico Fermi Dead at 53; Architect of Atomic Bomb". New York Times. 29 November 1954. Retrieved 21 January 2013. ↑ Hucke & Bielski 1999, pp. 147, 150.